breeding of a more ‘draught’ type of pony; more suited to work in the coal mines of North East England. The coming of the railways resulted in the contraction of the commercial horse haulage industry. Frank remembers a time when the Fell Ponies were always called Galloways, of which there were two types; a lighter/ riding type and a stockier /more draught type. 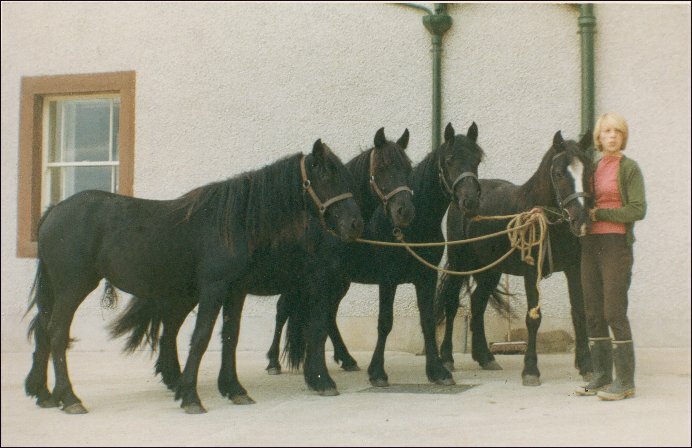 If the breeders of Galloway / Fell Ponies followed the same path as the breeders of Shetland Ponies, this division into two types of Galloway pony resulted from increased mechanisation rather than previously when the Galloways had provided foundation stock for the English Thoroughbred. 1945 Four ponies went, with Mr Roy Charlton acting as go-between, to Balmoral, the ponies were paid for in white, five- pound notes. Other Lownthwaite ponies would follow them into the Royal Mews. IIn 1947/ 48 two ponies were sold to Mr EP Taylor, Ontario, Canada. They preceded Johnnie Walker, 4140, who was bought by Mr EP Taylor while on a visit, to The Ponies of Britain Show, in 1966. 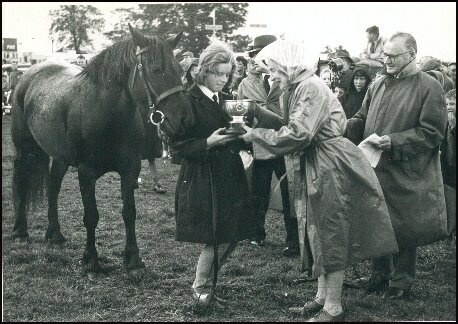 Miss Peggy Crossland arranged for a number of ponies to go to the show, at the request of Mr Taylor. Two ponies went from Lownthwaite, Johnnie Walker and a yearling colt. Christine travelled with the ponies, while Frank and Rosemary Meek went by car later that day. Many of the pony owners and handlers slept in the ‘jockeys accommodation.’ Miss Crossland slept in the hayrack, in her pony’s stable! The food was terrible, the mud was over the top of boots: funny the things you remember? In 1953 Harry Wales was elected as Chairman of the Fell Pony Society. He was concerned that the true Fell Pony was being lost to ponies that were too much like Dales ponies, in addition many of them were too tall. The Fell pony Society Council decided that all the Fell Ponies paraded at the Stallion and Colt Show would be measured; and those, whose height exceeded 14 Hands High would not be allowed to compete for the stallion premiums.